You’ve found the one. And as if they weren’t perfect enough already, they love the outdoors just as much as you do. If your ‘significant other’ loves to wake up at 5:00 AM for sunrise hikes, and will jump into any lake, river, or ocean regardless of how cold the water is – and convince you to jump in, too – then you need a proposal that’s going to fit your relationship. At The Activities Industry Mutual we understand that bearing your soul and going out on a limb to ask someone to spend the rest of their life with you can be a daunting prospect! But for all the adventurers among you, we want to help spark your inspiration for your outdoor, adventurous, and nature-filled proposal. So, here’s the scoop on everything you need to know; from the best time of day to pop the question outdoors, to actually getting down on one knee! If you don’t want to take a big risk when you pop the questions maybe think about a romantic hike and a picnic instead. Activities Industry Mutual Members, Adventure Britain, helped adventure loving Dan propose and caught it all on camera for us to enjoy. 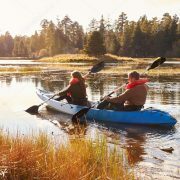 If you and your loved one have an affinity for the ocean, then a kayak or paddleboard proposal may be perfect for you. Worried about transporting the ring across the water? Place it in the kayak hatch ahead of time and during a break, ask your partner to grab you some water from the hatch. Surprise! Do: Sunrise and sunset are the most beautiful times on the water. Not only is the sky gorgeous, but the water is often calm. Sunrise has the best chance of glass-like conditions! Advice: Be flexible! The weather has a lot to do with the proposal. A windy/choppy day would not be ideal, especially if the ring is going to be on board the kayak or paddleboard. 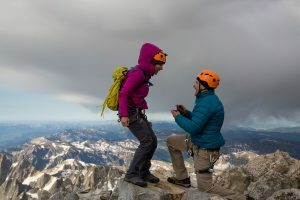 If your significant other enjoys pushing themselves to the limits, likes trying new things, and is athletic, but you want an outdoorsy proposal that doesn’t depend on the weather, a proposal with climbing involved may be exactly what you are looking for. This proposal is recommended if climbing is already a part of your life. 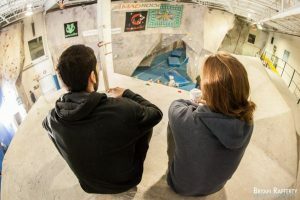 For a lot of climbers, it’s an addictive sport that becomes a passion, so it makes sense to propose in a place that is a big part of your lives. What if this is your first time climbing? The experts do not recommend this proposal method if you are a beginner! “Climbing is not just physical activity, it is a mental exercise, so it might be overwhelming for you and your partner if it is your first time”. Before you get there, arrange to have the staff put the ring in a hold halfway up a route. Guide your significant other up the route and at the opportune moment, take the ring from the hold and propose while climbing! Or why not lead your partner to the correct hold so that they reach up and find the ring themselves? A popular first date is climbing. Try to recreate the same climb or same events from the first date for the proposal. Invite your friends and supporters to secretly come and surprise your partner and celebrate with you. Do: If you want a crowd cheering you on after you propose, then a weekend or weekday evening is perfect. But, if you want a more intimate setting, then any weekday before 5, especially in the morning, is when you want to pop the question. Treetop courses can vary in degrees of difficulty, but pretty much anybody who’s adventurous can find a route that’s appropriate for their comfort level. Challenge your partner to a ‘race.’ When engulfed in the spirit of competition, get down on one knee and propose – they’ll never see it coming! …Don’t worry! Special twilight climbing hours in the summer provide the perfect time of day to pop the question and then head to a fancy restaurant for dinner. Do: Any time is ideal. Want privacy? Any weekday, especially in the morning. Like the lime light? Plan for a weekend proposal. Avoid: Any day that might rain! As long as you and your loved one are fit and healthy you should be able to make it up the mountain. Make sure you plan your route, have all the relevant equipment, clothing and supplies you need- oh and don’t forget the ring! Take your other half on an adventure up a mountain with a fabulous view at sunset. With the adrenaline from the climb and the sense of achievement once you both reach the top, take a moment to relax, take in the view and tell your other half how fabulous life is with them. Finish your speech by popping the question! Sun rise and sun set are beautifully romantic times to pop the question, especially with an amazing view. Have Champagne and a bubble bath with candles waiting at home so that you can both refresh after your adventure! Do: Any time is ideal. We hope you’ve been inspired by some of our romantic suggestions. AIM was established in 2005 in response to growing demand within the sector for a cost-effective alternative to traditional insurance cover.